Not too long ago I downloaded an app for my phone so I could learn some Hawaiian phrases. When spoken authentically it’s not only music to the ears but it’s a solid study of meaning and nuance. For many reasons, the app sits unused on my phone these days. The more I experience the language from those who live it the less I want to “pretend” to understand it. 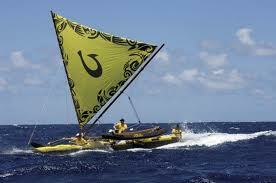 For example, at the recent Olukai Ho’olaule’a events the experience surpassed the words. To quote from the event’s website, “Ho’olaule’a – literally means “celebration”, but for [Olukai], it’s also an expression of gratitude. Each May, we hold our interpretation of this storied Hawaiian tradition on Maui’s north shore. The event blends elite competition with family-friendly cultural activities and gathers some of the world’s best SUP and OC1 paddlers to race the legendary 8-mile Maliko downwind run. Friends and families come together to enjoy canoe sailing and surfing, ancient Hawaiian games, traditional luau, hula, and live music. We take this opportunity to recognize and honor our ‘Ohana Giveback partners, as the community shares collective gifts of time, energy, and spirit. After the event, Ed and I strolled down the beach to wait our turn for a ride on the Olukai sailing canoe. The team’s canoe had been blessed in the traditional ceremony just the evening before. A group of guys wearing the yellow Olukai shirts were sitting in the sand, so we joined them. One, Ross Ka’a we later learned, greeted us with a smile and drew out our stories of sailing, our love of the ocean and such. We learned a bit about his life, paddling and a few races but not much more. It was obvious that he was a waterman, but the extent of his spirit of aloha hadn’t hit us yet. We took our turn on the sailing canoe, zooming through the surf and sun – WOW! what a chicken-skin ride! Soon after that it was time for the awards ceremony. At the front of the stage was a full sized outrigger paddle made of a blend of koa and native woods. It was set on a base carved in the shape of four Makau, or bone hooks. 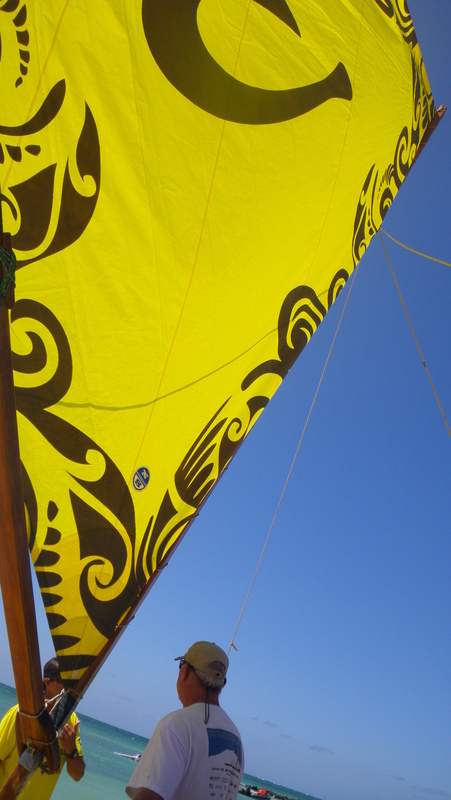 That Makua is the Olukai mark, the traditional Polynesian symbol worn for strength, good luck, and safe passage over water. Later during the awards ceremony for the Maliko Gulch competitors for the Ho’olaule’a event we had another treat. Little did we know that we had been chatting on the beach with Ross Ka’a, the master craftsman who created that award. He never gave a hint as to his relationship with the team or his expertise in building traditional paddles and crafting with wood. Speaking with some who have known Ross for decades, we learned he is a master wood worker gifted in the craft of making art pieces from native woods. He has been a friend to Olukai for a long time. Toward the end of the awards ceremony Ross was called up to present the trophy he’d created to Olukai team leader, Marvin Otsuji. Marvin has been leading Team OluKai as master steersman for 25 years. The team broke the longstanding record in the Na Holo Kai race and captured the overall 2008, 2009 and 2010 season championships. Marvin led the team to the most winning record for the past 15 years straight. Not only is Marvin a great waterman with an innate knowledge of some of the trickiest channels in the world, he competes with pure “aloha.” In a sport where wind and weather, equipment and demands of the sport can wreck havoc on any given race, his consistent success could be rooted in his love of the sport – without expectation. That’s pure aloha mixed with tradition and culture. Yes, I think it is time to delete that app from my phone. Learning to pronounce a few Hawaiian phrases pales in the face of experiencing the meaning behind the words. Practicing pronunciation – not so much. “Living” a life with aloha and embracing the day with Ho’olaule’a – now we’re talking! This entry was posted in Hawaii, People and tagged elder sup, Ho'olaule'a, Marvin Otsuji, OluKai, SUP by Water Words. Bookmark the permalink.